Summary: What to do to transfer data between Android and iOS? If you used to use an Android phone and now you are about to get a new iOS device, how can you transfer data from Android to iOS device, such as iPhone, iPad, iPod touch? For friends in need, please see the detailed tutorial below. When you get a new iPhone or iPad, how do you import data from an old Android phone to new iDevice? It is quite troublesome to re-enter data one by one, especially between two different operating system. What's more, Apple iOS system is relatively closed, it supports data transmission via Bluetooth only between the same iOS systems and also iTunes only allows to transfer purchased items. In this case, how to achieve Android and iOS cross-system platform data exchange? Let's read on to learn more details. 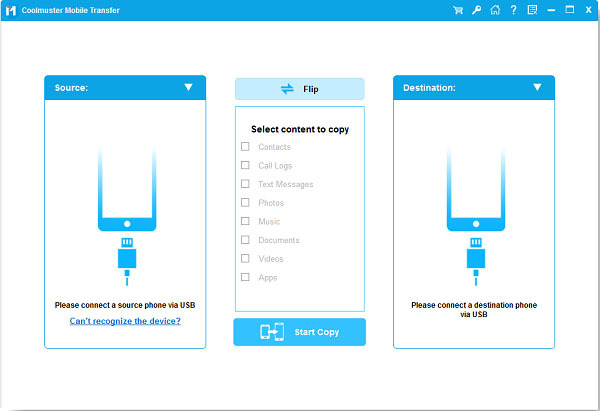 This Phone Transfer software is designed to help users easily transfer data from phone to phone, which can also act as an Android to iOS Transfer tool to transfer files from Android to iOS device as well. With it, you can directly transfer data from Android to iPhone, iPad, iPod with 100% security. Various files are supported, including contacts and eBooks (PDFs and ePubs). And it is widely compatible with almost all Android and iOS devices, including but not limited to Samsung, HTC, LG, Huawei, Sony, ZTE, Motorola, OPPO, Meizu and iPhone iPhone X/8 Plus/8/7 Plus/7/6s Plus/6s/6 Plus/6/5S/5/SE, iPad Pro, the new iPad, iPad Air, iPad 2/1, iPad mini, iPad with Retina display, iPod touch/Shuffle/Nano/Classic and etc. What's more, it is truly easy to use the software and you are offered the detailed instructions as follows. Now, why not have get the free trail version and give it a try by yourself? Both Windows and Mac version of the program are available below, please choose the right version to download and install on your computer. First of all, it is recommended to you the easiest way to transfer data from Android to iDevice, that is, using the professional Android to iOS Transfer - Phone Transfer software to directly transfer data from Android to iOS. In this part, you will see how easy it is and you can complete the job within 3 steps. Enough talk, let's look through it together. Step 1. Have your devices recognized by the program. Launch the program on your computer after downloading and installing, then you might see the primary interface as below. Please connect your Android and iOS device to the same computer with 2 USB cables. - For Android device, please follow the onscreen prompt to enable USB debugging on your Android device to have your Android phone connected to the program. - For iOS device, please make sure the latest iTunes has installed on your computer and follow the onscreen prompt to make your iDevice recognized. Step 2. Make sure both devices are on the correct side. When both Android and iOS device are connected successfully, to transfer data from Android to iOS device, please ensure that iOS device is on the Destination side while Android phone is on the Source side. If not, please click "Flip" button to change the position. Step 3. Select contents to transfer from Android to iOS device with 1 click. When all above are prepared, please view the available contents in the middle panel and select the desired file types by checking the according boxes. Then simply click "Start Copy" button to start moving contents from Android to iOS device immediately and directly. Apart from Coolmuster Mobile Transfer, there is another optional choice for you to transfer data from Android to iOS. The Move to iOS app can also help you switch from Android phone to iPhone, iPad, iPod touch, even though it is more complicated and needs more steps to complete data transfer comparing with Coolmuster Mobile Transfer. Anyway, if needed, you can refer to the instructions below to help you import data from Android to iOS device with Move to iOS. Step 1. Check if your devices are supported by Move to iOS. - Not all of Android and iOS devices are supported by this app. - The supported devices include Android 4.0 or later, iOS 9 or later, iPhone 5 or later, iPad 4th generation or later, iPad mini 2nd generation or later, iPod touch 6th generation. Step 2. Have your Android and iOS device prepared. - Download Move to iOS from Google Play and install it on both of your Android and iOS device at the same time. - For Android phone, please make sure Wi-Fi is turned on and connected to an available Wi-Fi network. - For iOS device, please ensure the contents you're transferring (including what's on the external Micro SD card) fit on your iOS device. - For both iOS device and Android device, please plug them into power. - For Chrome bookmarks, to transfer Chrome bookmarks to iOS device, please update Chrome to the latest version on your Android phone. Step 3. Go to Apps & Data screen on iDevice. - When you set up your new iOS device, please go to the "Apps & Data" screen and tap "Move Data from Android" option. - If you have already finished setup, you are required to erase content and settings on iOS device to set up your iDevice again. Before that, please remember to back up data on your iDevice in case of data lost. Step 4. Launch the Move to iOS app. - On your Android phone, please run the Move to iOS app and tap "Continue" option. - Tap "Agree" option after reading the terms and conditions it shows. - Tap "Next" option at the upper right corner of the "Find Your Code" screen. Step 5. Wait for a code and enter it. - On iDevice, please tap "Continue" option on "Move from Android" screen. Then all you need is to wait for a ten-digit or six-digit code to appear. - If you receive an alert about weak Internet connection on your Android phone, just ignore it. - Enter the code you receive on your Android phone, and wait for the "Transfer Data" screen to show up. Step 6. Select desired content for transfer and wait. - On your Android phone, please choose the content that you want to transfer and tap "Next" option to start transferring. - Please do leave both devices alone till the loading bar on iOS device finishes, even though your Android phone has already shown the process is complete. - How long the whole transferring process will take depends on how much content you are transferring. Step 7. Set up your iOS device and finish the steps. - When the loading bar is finished on iOS device, please tap "Done" option on Android device. - Then tap "Continue" option on iOS device and follow the steps on screen to set up your iOS device. - Check your iOS device to make sure your contents are transferred successfully, such as photos, music, books and more. After reading the above content, it is believed that you have the two methods to transfer data from Android to iOS device in mind and you can choose your preferred one. Personally, I think it is easier and more effective to switch from Android to iOS device with Android to iOS Transfer in Part 1. What's your preferred one? You are welcome to leave your question or comment below to let us know. Thanks for support!